vancouver, yvr, articles and credit cards. 23 Responses to "The Amazon Visa is no more - but here's what you can replace it with"
I applied for the Home Trust Preferred Visa on January 17, 2018 and today (February 22, 2018) received my security PIN in the mail (which is the first sign I got that I actually got approved). So, I can confirm that it takes about a month. (1) The Rogers Platinum MasterCard, which doesn't waive the 2.5% foreign exchange fee but does give you 4% cashback on foreign purchases (4% - 2.5% = 1.5% effective cashback). (2) The Fido MasterCard, which is similar (4% cashback on foreign purchases). Muber - I have the Rogers FIDO Mastercard, and what you've said isn't QUITE true -- you can phone them once a year and get your cashback applied to your mastercard bill (i.e. phoning in December and having a year's worth of cashback applied to your January credit card payment). But only once a year, if you phone them. Seems like a legal thing or else they can't call it a cashback card, or something. I can confirm that it works. I also submitted my Home Trust Preferred Visa application on Jan 17 (as soon as I got my notification from Amazon about their card). My card arrived 2 days ago on Feb 28. I love the roadside assistance and the rental car waiver - try finding another no fee credit card with those features! However I read that there is no tap payment option (no big deal outside of Canada), the only way to change the PIN is to get a new card number (supposed to be fixed later this year), and you can only do 10 purchases a day. I applied the beginning of February and finally got my card last week. Their application is very thorough and I had to send a bill as proof of my address. I used it the other day and no problems. Waiting to see what the exchange rate will be. The Scotiabank Passport also has a $110 per year fee. Doing the math, I would have to spend over $5k/year while traveling just to start to break even with the free Home Trust card. And even then, I'm not sure at that point if using the Passport card would be better, depending on how the extra 1% cashback with the Home Trust compares against Scotia Reward Points. Justin, you are referring to the regular Scotiabank Passport, not the Infinite version. Ah thanks Jay, it looks like the Infinite version might not be released yet. I found some info that stated it might have a $139 fee when it's announced, but also saw some other info that said it might be free. I'm guessing maybe waived for the first year. I can confirm the PIN can't be changed yet. I ended up getting both the Home Trust and Fido cards. But I guess the Fido card is better. They're equivalent, except Fido is 1.5% cash back,not 1%. They charge the 2.5% foreign currency fee but then give 4% cash back on foreign currency transactions. You have to remember to phone them 1x per year but it can be anytime. I already phoned them last month for my Jan 2019 statement credit. Plus, the lack of "tap" on the Home Trust I find annoying. All things being equal, I use it as my main card, so why not get an extra 0.5% cash back? According to Rogers Bank website, they are dropping the cash back on both the Fido and Rogers MC to 3% for Foreign Transactions. Also still waiting for my Hometrust Card! Home Trust told me last week that, because of the volume of applications they had received from Amazon card holders, it will take another 8 weeks before they can say whether my application is approved. JK: Thanks for the info. I have seen a few articles and blog posts over the years that suggest that Visa's base exchange rate is a little bit worse than Mastercard's. The difference is pretty tiny, but if you Google 'mastercard vs visa exchange rate' you can find some articles with evidence to back it up. Shaker: Yep, but you do still pay the hidden 2.5% fee (inflated exchange rate). Better than other ATM fees though, where you pay both the hidden fee and the additional obvious fee. One more quirk of the Home Trust Visa. The 10 transactions don't work on weekends as they have to clear the bank before the next 10 are allowed. Or so i was told when my card was stopped on a Sunday. So if you are traveling on a Saturday and need to use it Sunday, count your transactions. Wddon't use it for small items on weekends. Other than that it's been a great card. Have had it for over a year with no issues. I applied for and received the Home card on your recommendation for travel abroad. They have been nothing short of EXCELLENT! AND i was able to change my password over the phone before I left. I have been using Brim's free card for about a year. It works great in all European countries that I have visited. 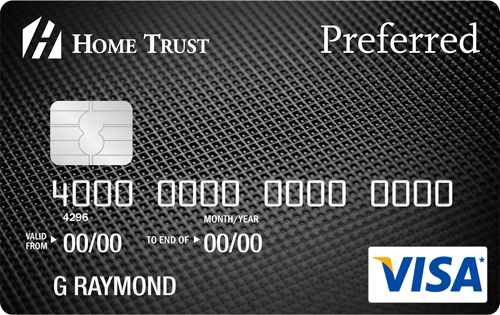 You can now change the PIN number on a Home Trust Visa to a number that means something to you personally. Applied for, was approved for, and received the card for myself and my wife within one month. Changed the PIN over the phone, and it was confirmed with my first PIN-required transaction (at the liquor store :-). They also have a rudimentary website that allows to track transactions and receive notices and alerts by email. All great so far! They just gave a year of Amazon Prime to card holders.